Vodafone India has announced the launch of its Flex, a new service for its prepaid customers. This new Flex service comes without any pre-fixed quotas for Data, Voice, and SMS. Users can enable Vodafone Flex with a single recharge. 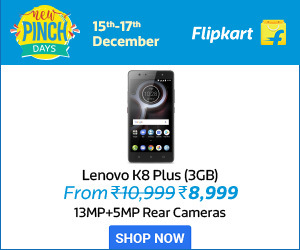 The company has listed its Flex recharge plans and variation in the price as well. The new concept from Vodafone lets the subscribers to as they prefer and need. Separate plans are also available for the users who don’t use the internet, moderate users of the web, larger voice call users and heavy users of Internet and voice calls. Vodafone mentions that extensive research has developed the concept Flex after gaining insights into the prepaid customer’s preference, usage and evolving needs. The concept Flex is essentially a unit of fixed amount a user is served with when he/she chooses a Vodafone Flex plan. The user will buy the flex currency with their money. As if now, 1 Flex values 1MB of Data or 1 SMS or a minute of a voice call on roaming. Few services like outgoing STD calls costs more than 1 Flex. The units of Flex will reduce as per the usage of various services. Customers of this Vodafone Flex service can carry renew the validity of the unused flex. 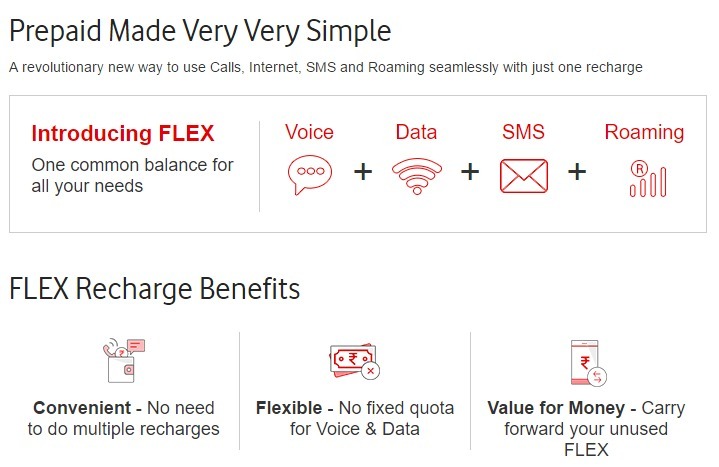 Vodafone FLEX plans range from Rs.117 to Rs.398 comprises of Data, Voice, and SMS and allows the user to opt for the plan as per their usage. However, the company is providing the denominations only for Delhi circle at present. “Vodafone has always been at the forefront of innovation. With Vodafone FLEX, we aim to revolutionize the pre-paid world by addressing the needs of the customers. 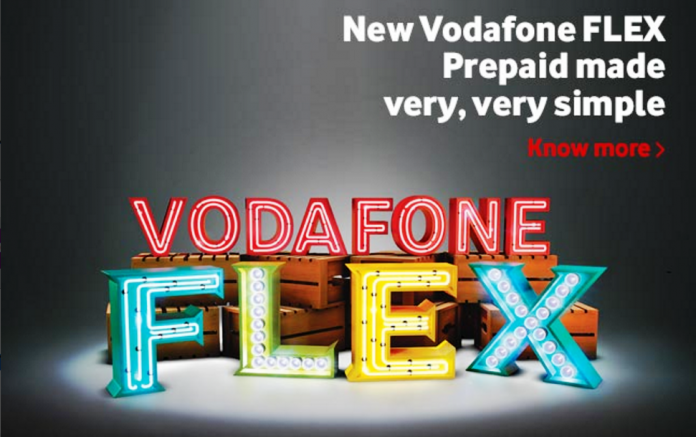 90% of customers prefer to use prepaid, and Vodafone FLEX has been specially designed. The singular objective of making the user experience of the hundreds of millions prepaid customers simpler, richer and more enjoyable. It gives prepaid customers total control with the flexibility to use their Flex as per their individual choice and usage style – more for voice or more for data – offering greater value for money,” says, Sandeep Kataria, Commercial Director of Vodafone India. Vodafone has recently announced the collaboration with the state-run BSNL over the sites for a better service in rural areas. This innovative move might help the telecom to reach its targets in an Indian market.